This healthcare metric generally tracks the percentage of unplanned patient readmissions to a hospital out of the total number of readmission cases. The KPI focuses on readmissions that occur up to 1 month after the initial visit. Unplanned readmissions tend to indicate a problem with the initial care patients received. When your hospital or healthcare facility has a high readmissions rate, it can indicate a variety of issues in both treatment effectiveness and quality of care. High rates also impact hospital productivity and the availability of beds for new patients. Reducing hospital readmissions is paramount for lowering operational overheads. It is also a good indicator of how other measures are working when used in conjunction with initial treatment KPIs. To calculate the unplanned hospital readmissions rate, you just subtract the number of unplanned readmissions from the total number. Then, divide the result by the total number of readmissions to find the percentage rate. You can also divide it further by exploring readmissions at different intervals up to 30 days. Additionally, you can compare this information against data pertaining to a patients’ lifestyle and health indicators. 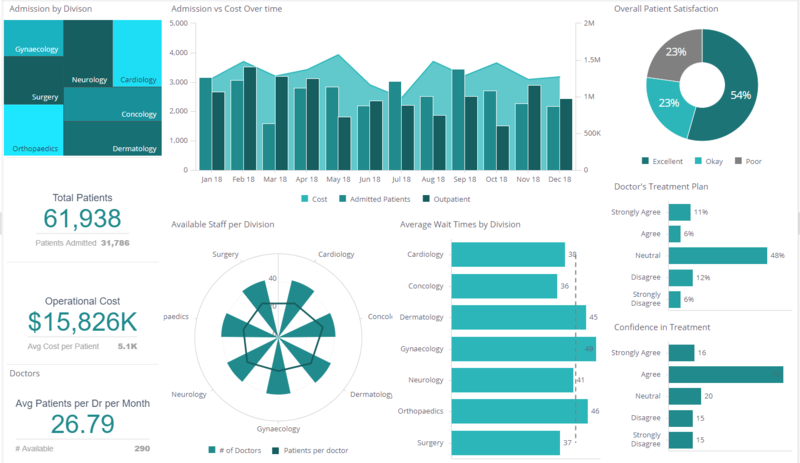 Most of the data required to measure hospital readmission is readily available in hospitals’ CRM tools, alongside specific data from different units and departments. Let’s say you notice a large uptick of repeat patients alongside a dwindling availability of beds. Most patients seem to have the same medical procedures completed and have been readmitted within two weeks of being discharged. Measuring hospital readmission rates can reveal a connection between treatment decisions and procedures alongside the rate at which patients are returning. You can track who the attending physician is, as well as what treatments were administered to see if there is a pattern. Additionally, you can see what conditions the unit is in to determine if patients are at risk of infections or complications. Finally, it can help you determine if adding steps such as post-op consultations or better discharge planning strategies could reduce the problem.